I'm not asking you to click every ad you see on this site, but if you see something of interest, it would be helpful if you clicked through to learn more. Of course, most of you don't see any ads on this site, because you're using AdBlock or Adblock Plus for Google Chrome or Mozilla Firefox. I'm the last one to judge. 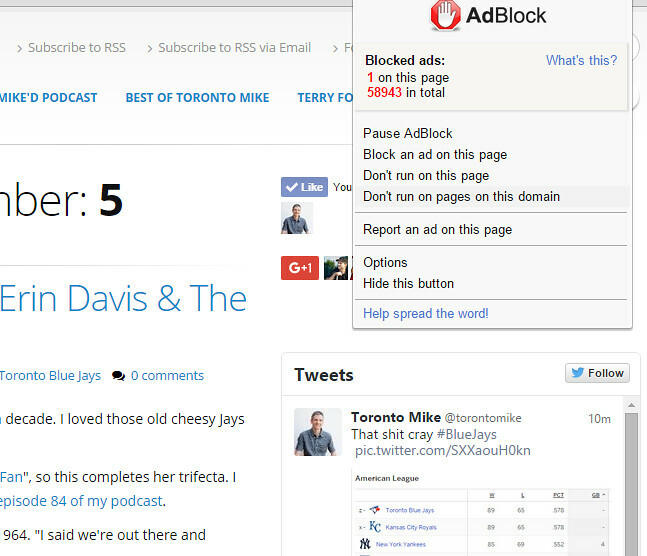 I've been using AdBlock or Adblock Plus for a decade now. But, there's no harm in kindly asking you to disable AdBlock or Adblock Plus on this site, is there? It's simple, and I'd really appreciate it. Simply click on the AdBlock icon in the upper right hand corner of your browser and click on the button that says "Don't run on pages on this domain." 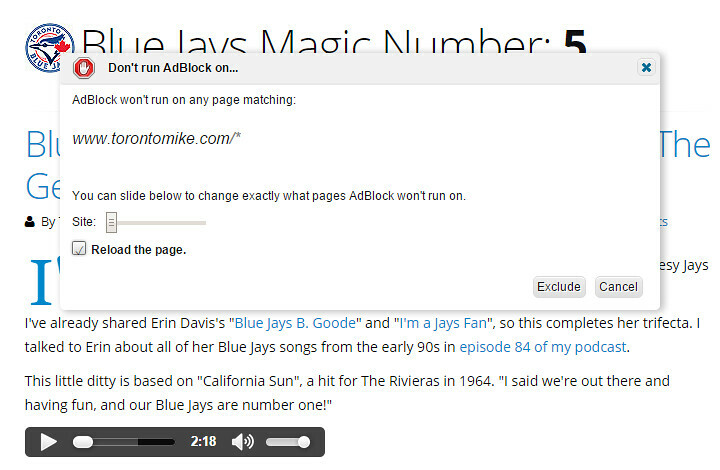 Then, after a pop-up box appears titled "Don't run AdBlock on...", click on the button that says "Exclude." Are you running first or third party ads? Because it isn't you I don't trust. It's the ad networks. They're so devoid or morals and quality control (which, in turn, is because of being devoid of morals), that they're actively dangerous to the end user. Just this year, BOTH DoubleClick (google) and Yahoo were serving up malware as ads. This is because someone managed to exploit the ad networks to serve "ads" that contained code that exploited Flash. Boom, infected machines. And OF COURSE it isn't the ad network's fault. They just resell access to various advertising agencies. And of course it isn't their fault, because they just sell campaigns to individual firms. And of course it isn't THEIR fault because they have a huge client list that they just sell access to. And of course it isn't any of those THOSE people's faults, because they just accept ads to run. And so on. Ask how malicious and dangerous exploits end up on an ad network, and everyone just throws up their hands says "Oh, well, it's not like we can CONTROL that. *WE* don't review the ads, someone else does". Conveniently, it's no one else's fault, no one can stop it-- and yet everyone is making money off of the activities. Conveniently. Well, except for the sit owners and content creators-- who have seen less and less revenue from ads over the years as they are systematically screwed over by the ad network. Which BAFFLES my mind as to why site owners defend the networks. But that's another rant. So I'll say the same thing I always say: It isn't you I don't trust. It's the ad networks. You're (this is more the "royal you" than you specifically, Mike) want me to expose myself (and friends and family) to a huge risk to cover your costs. Well, the cost of technicians to clean up an infected PC are in the order of $120/hour. Are you willing to agree to cover MY costs when I have to spend money (or time) to clean up the damage from malware delivered from your site? Or pay the hundreds or thousands of dollars to ransom-ware? Or better yet, since you're an established site: throw up a Patreon. Sure, not everyone can afford to give you money every month, but you're on my top 10 sites. I can afford it. Hell, if I give you a loonie a month, it's still going to be orders of magnitude more than you'd earn from me per month from ads. And everyone will be happier and safer. Except the ad networks. But screw them right in the bed they made for themselves by profiting off malicious ads they allow. Not even mentioning the privacy factor, since that's a whole other legit discussion. Say, I seem to remember a tweet not too long ago about an alternate funding source... is it fully public yet? I don't think I've ever seen an ad on a website ever that has interested me and wanted me to click it. You still get paid just for hosting ads whether they are viewable to people or not, correct? These ads only pay when they're clicked. The ad I just saw was for a 50% sale at Mark's. How could you not be interested in that?